Industrial output growth rebounded in January on the back of some revival in manufacturing, mining, capital goods and consumer durables sectors as key segments displayed signs of recovering from the impact of demonetisation. Industrial output rose 2.7% in January from a decline of 1.6% during the same month a year earlier and above the revised 0.1% contraction in December. 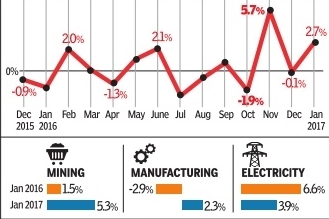 The manufacturing sector rose 2.3% in January compared to a contraction of 2.9% in January 2016, while the electricity sector rose 3.9% year-on-year during the month compared to 6.6% expansion in the same month last year. The mining sector rose an annual 5.3% in January compared to 1.5% growth in January 2016. Overall industrial output growth during April to January rose 0.6% compared to 2.7% in the year earlier period, highlighting the fact that the sector still remained sluggish. 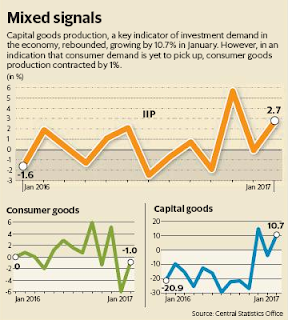 The capital goods sector, a key gauge of industrial activity, rose an annual 10.7% in January compared to a decline of 21.6% during the same month last year. The data on capital goods has remained volatile prompting economists to call for a revamp.